Ideal to provide extra protection in Men (Top) and adjust the size of the Men. Ideal to provide extra comfortable protection the wrist and the back Palm for less chance of getting injured from Kote strikes. 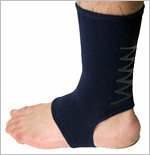 Ideal to provide extra protection of the Kote (wrist), and absorb the sweat.